The religious and cultural tour package, Janakpur Tour trip combines a visit to Janaki Temple, Ram Sita Bibaha Mandap, Ram Mandir, Dhanush Sagar and many more. 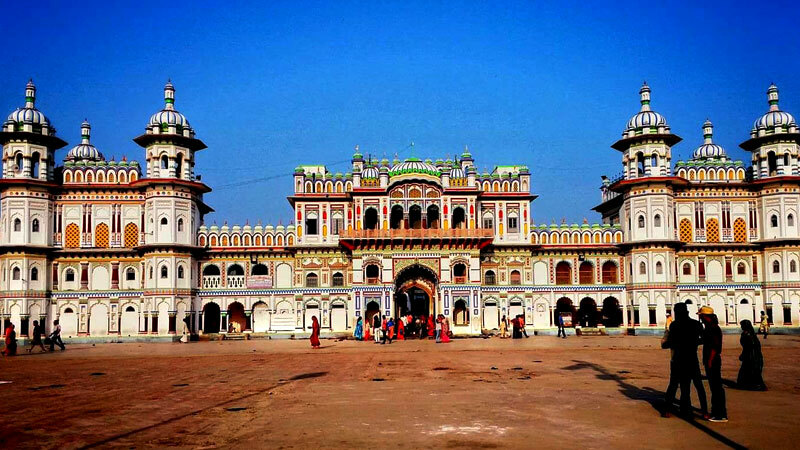 According to historical sources, Janakpur also known as Janakpurdham was the capital of an ancient Mithila Kingdom where the emperor king Janak was ruled. As mentioned in Hindu epic, Ramayana, he found a baby girl in a furrow then named her Sita and raised her as his daughter. Sita is believed to be an incarnation of goddess Laxmi. When she was sixteen, king Janak offered her in marriage to anyone who was able to lift the divine bow of Shiva which was left at the northeast of Janakpur a thousand years before. Many royal princes tried it but could not even move it. On that occasion, the prince of Ayodhya Kingdom, Rama became able to lift the bow and surprisingly broken into three parts. One part penetrated into the land, another flew over, and the third one had fallen into Dhanusa spot. Therefore, this place is worshipped as Dhanusha Dham. This made the king glad and as per his words, he happily marriage Sita with Ram. The place is still there and worshipped as Ram Sita Biwaha Mandir. As Sita, Ram is also considered as an incarnation of god Vishnu. Janakpur city is located 225 km to the south-east of Kathmandu Valley via B.P Highway. It is also connected with 35 minutes flying distance. Janakpur is situated at an altitude of 74 meters above sea-level near Nepal India border. Janakpur Tour begins with an eight-hour drive from Kathmandu through Sindhuli. Roads are comfortable and black-topped. After crossing Dhulikhel, roads are snaky till Bardibas. Afterwards, the road is straight and entered into Terai Region of Nepal. After such a long journey takes rest at the hotel, this day and next day explore all religious places of Janakapur and drive back to Kathmandu. The tour finished with a day UNESCO World Heritage sightseeing in Kathmandu. Day 02: Drive to Janakpur. Breakfast at hotel. Around 8 am proceed to Janakpur. It is 225 km distance from Kathmandu via B.P. Highway and takes around 8/9 hours. The journey will follow the Dhulikhel, snakey road of Sindhuli, and many other small villages. After crossing Bardibas, Terai region of Nepal will be entered and from there the road is straight and flat. Arrival at Janakpur and check into the hotel. Take rest and free time. Overnight at Janakapur. Today you will be visiting all religious places of Janakpur like Janaki Temple, Ram Sita Biwaha Mandap, Ram Mandir, Dhanush Sagar, Ganga Sagar, and Dhanusha Dham. Then back to hotel and free time. Overnight at Janakpur. Exploring such a holy dham, drive back to Kathmandu following the same route. Overnight at Kathmandu. Take breakfast and you will have free time until 12 noon (hotel check out time). Then, transfer to the international airport for your onward destination. The time has come to say goodbye and bring the beautiful memories with you. Janakpur Tour Trip finished here! Twin Bed sharing (2-5 star) hotel accommodation at Kathmandu and Janakpur. Kathmandu to Janakpur and back by private vehicle. Janakpur Sightseeing by private vehicle. Wants some modification on Janakpur Tour itinerary? contact us to customize it.